Static fields and properties are data members associated with a class itself, rather with instances of that class. A static constructor can be used to initialize static members. Static fields can also be initialized when they are declared. For example, initializing an instance of a Dog leads to the output shown below. 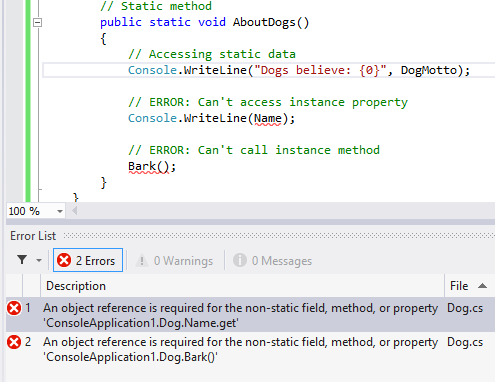 However, if we access these static members from code within the Dog class itself, we can omit the class name when referencing the static members.